From time to time Nordic4DFrame will have newsworthy items that we would like to pass along. They are listed in “stratigraphic order” with the most recent ones first and the oldest ones last. 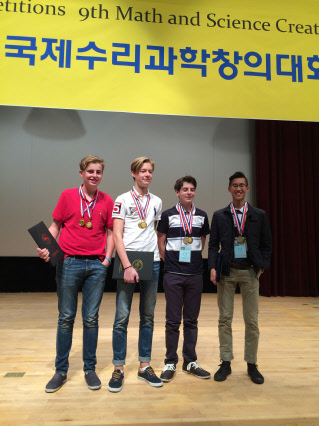 Four Swedish students and two of their teachers from two different ninth grade classes were contestants in the 1st International Math and Science Creativity Competition that was held at the National Science Museum in Daejeon, South Korea, on 31 October 2015. This annual event is organized and sponsored by 4DFrame, a Korean educational company, whose products are widely used from preschool to university classes in that country. These same four students were the finalists in the first Swedish 4DFrame contest that was held at four science centres—Umevatoriet (Umeå), Innovatum (Trollhättan), Tekniska museet (Stockholm), and Vattenhallen (Lund)—with the help of Nordic4DFrame AB earlier in the year. This preliminary competition was run by the four science centres with financial support from Skolverket. Besides participating in the competition (where they were awarded medallions for best science centre contestants), the ninth graders visited children in Korean schools, and toured several cultural sites as well as other science centres during the week they were there. This will be an unforgettable month in the lives of four Swedish high school students and their teachers as they travel to South Korea, to take part in the international 4DFrame competition to be held there on 31 October. The two teams—first place winners Charlie Malmqvist and Eric Portela from the International English School in Lund, and second place winners Oscar Åkesson and Niklas Olsson from Strömslund School in Trollhättan—were the finalists in Sweden’s first 4DFrame competition. Third and fourth places were held by Ratpoom “Poom” Kaewsai and Adunwit “Ta” Injanthuek of Tegs Central School in Umeå, and Axel Berggren and Fabian Olsson from the Skuru School in Nacka (Stockholm metro area). The first part of the competition was held in late May at four science centres across Sweden; Umevatoriet (Umeå), the National Museum of Science and Technology (Stockholm), Innovatum (Trollhättan), and Vattenhallen (Lund). All the groups of students who competed had the same task to perform—build something out of the same 4DFrame materials that can move by using wind power—in a specified amount of time. An additional part of the challenge was to first make a drawing of what they were going to build as well as describe the math and science principles used in its creation. The four winning teams from this stage were then asked to produce a short video describing what they had done as the second part. These were reviewed by an international team of judges from Sweden, Finland and South Korea, and the first and second place teams were announced in September. Speaking about the first prize entry, Mr. Ho Gul Park, South Korean architect and the inventor of 4DFrame said that “Their video and concept shows much appreciation for our Korean culture. They have not only made efforts to translate the material into English so that we could understand [it], but have also deeply researched into our traditional [rice] mill[ing] background and showed much creativity and intellect in their design.” You can see the first place video here. The four Swedish students will be doing more than participating in the “Enlightening Imagination - Math and Science Competition” at the National Science Museum in Daejeon. As part of their visit they will visit Korean schools, two large science centres, and have a one day course in 4DFrame with Mr Park and his wife, Mrs. Yang. There will also be time to participate in cultural activities as well. We here at Nordic4DFrame wish the two Swedish teams the best of luck in October’s competition. First 4DFrame Competition in Sweden! The week of 18 May saw the first 4DFrame competition to be held in Sweden, with the final goal to take four students to compete at the international competition to be held in October 2015 at the National Science Museum in Daejeon, South Korea. 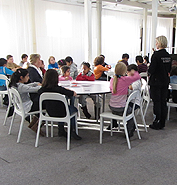 Four science centers ran the first part of the completion; Vattenhallen Science Center in Lund (on 18 May), and Innovatum Science Center (Trollhättan), the Swedish Museum of Science and Technology (Tekniska museet, Stockholm), and Umevatoriet (Umeå) on 22 May. All groups of students had the same task to perform for the competition—build something out of the same 4DFrame materials that can move by using wind power—in a specified period of time. 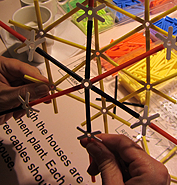 An additional part of the challenge was to first make a drawing of what they were going to build as well as describe the math and science principles used in its creation. Stay tuned for news in late summer about the final round to see which four students will be going to the international competition at the National Science Museum in Daejeon, South Korea! Did we see you at the Nordic4DFrame booth at the Karlstad Children’s Fair? Nordic4DFrame was one of over 100 different companies and institutions that had booths set up at Karlstad’s Children’s Fair 27-29 March, one of the largest child-oriented gatherings of the year. Mariana Back, Nordic4DFrame’s Managing Director, was there and had the opportunity to talk with both old and new friends. To help bring in the spring season, it was even possible to create some impromptu flowers made with 4DFrame, just one example of how this fascinating educational material can be used for spontaneous creations. Also presenting in the booth during the Children’s Fair was BernardiniS’pace, another Korean product-oriented company operated by long-time 4DFrame friend and supporter, Susana Bernardini. Perhaps you have noticed that Nordic4DFrame uses both Swedish and English on its website. Starting now, 4DFrame can offer text production, translation and editing work in many different areas. This may be of interest to 4DFrame users, and others connected with schools, education, museums, science centers, and other organizations—particularly in science and technology. The final cost for an assignment is based on how many edited words are to be delivered, and is also dependent on how fast you want the edited version back. If this sounds interesting to you, or your institution, please contact us so we can talk about it further. Many of you, who are involved with teaching mathematics, natural science, or technology, may already know that 14 March is the date of Albert Einstein’s birthday in 1879. But did you also know that 14 March is also internationally-recognized “Pi Day” in celebration of the most famous—and useful—of irrational numbers, which also happens to be a mathematical constant? And not only is 14 March Pi Day, but this year it has a very special connection to clock time since a particular moment of time on this date is the same as the first ten integers of pi’s value. 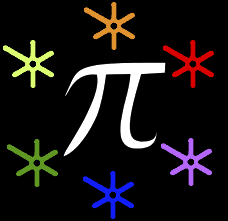 This Pi Day is special because at 09:26:53 on 14 March 2015 (i.e. 3/14/15) the time on our clocks in whatever time zone we find ourselves around the world will be exactly the same as the first ten digits of pi: 3.141592653! What exactly is pi, and why is it an important number? Most of us know it as that number that starts as 3.14, and then continues on ad infinitum without repeating itself. By late in 2013, mathematicians had used super computers to calculate the non-repeating value of pi out to 13.3 trillion (1013) digits. Seven digits had been calculated as far back as ancient times, where it was useful in geometry and trigonometry formulas involving circles, ellipses, and spheres. Why? Because pi is also the ratio of a circle’s circumference to its diameter. And it is still a very important number today as it is used in formulas in such wide fields of science and mathematics as astronomy, cosmology, number theory, statistics, fractals, thermodynamics, mechanics, and electromagnetism. The first Pi Day was celebrated in 1988 at The Exploratorium science museum in San Francisco, California, USA, and was organized by physicist Larry Shaw. Many people celebrate by doing things related to the kind of pie that we eat, and some places go so far as have pie-throwing contests. Albert Einstein lived in Princeton, New Jersey, for more than 20 years while he worked at the Institute for Advanced Study. Princeton celebrates with pies, a competition to see who can recite from memory the most numbers in the value of pi, and with an Einstein look-alike contest. If you’ve never celebrated Pi Day before, maybe this special year would be a good way to start. And if you happen to find a way to include working with 4DFrame in your activities, we here at Nordic4DFrame would like to hear about it! 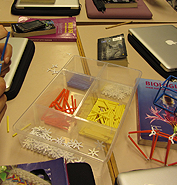 What happens when you combine the creativity of an artist/educator with 4DFrame? Click here and find out! 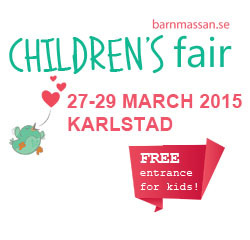 Are you going to the Children’s Fair that will be held at the Racketcenter Sport Hall in Karlstad on 27-29 March? Nordic4DFrame is one of over 100 different companies and institutions that you can meet there. The Children’s Fair is one of the largest child-oriented gatherings of 2015. See you there! Crisp winter weather with newly fallen snow on the ground on 9-10 January found a mixed group of 13 educators, artists librarians, and entrepreneurs attending the first Nordic4DFrame workshop to be held in our new office on the island of Rindö, which is located in the Stockholm Archipelago. You can find out more about this day-and-a-half long workshop here. Computer engineers + 4DFrame = creative fun! In December 2014, Susana Bernardini (Vattenhallen Science Center, Lund) was contacted by Anders Sjöström (System Manager at the Lunarc Center for Scientific and Technical Computing at Lund’s Technical University) about setting up a fun activity to take place during a training course they were going to offer to computer system administrators. Susana put together a package of 4DFrame materials for use by the 20+ participants, with the suggestion that they do an exercise that would require them to use their imaginations. Working together in teams of two, they were to construct a “dream machine” that could be anything that they wanted it to be, with the requirement that they had to explain what they had built to the rest of the group when they were finished. Instead of following the suggestion, the technically-oriented participants decided to make up their own original 4DFrame activity. According to Anders Sjöström, “We modified the task to building a contraption that would allow the shooting off of one part of the structure so it would go as far away as possible. The goal was to take the distance the separated section traveled in centimeters multiplied by the number of parts that made up the part that was shot away.” These two parameters lead to a point-awarding system, with the highest score becoming the winner. When the hour was up, all ten competing teams had finished their contraptions, shot them off, measured the distance the projectile had travelled, and calculated the final result. In the end, team #9 was the winner with 8 613 points (distance of 261 cm X 33 parts used to build the projectile). An interesting and creative use of the teams more technical backgrounds, Anders Sjöström says that, “The 4DFrame system was very well received and produced lots of laughs.” Perhaps this is an activity that you could see trying out for yourselves in the school classroom, or museum/science center workshop!